The super-stylish Aston Martin DB5 driven by Sean Connery as James Bond in the films Goldfinger (1964) and Thunderball (1965) sold at auction in 2010 for $4.6 million. The car was one of two Aston Martins that EON Productions was given for use in Goldfinger. One was outfitted with add-ons (like rotating number plates and guns that appeared through the tail lights) and dubbed the "Effects Car," while the other was for regular driving and dubbed the "Road Car." The latter was outfitted with all the special gear after the movie was finished, and went on to appear in Thunderball. The Road Car was originally sold for $12,000 in 1969 to radio executive Jerry Lee, who mostly kept it in storage. 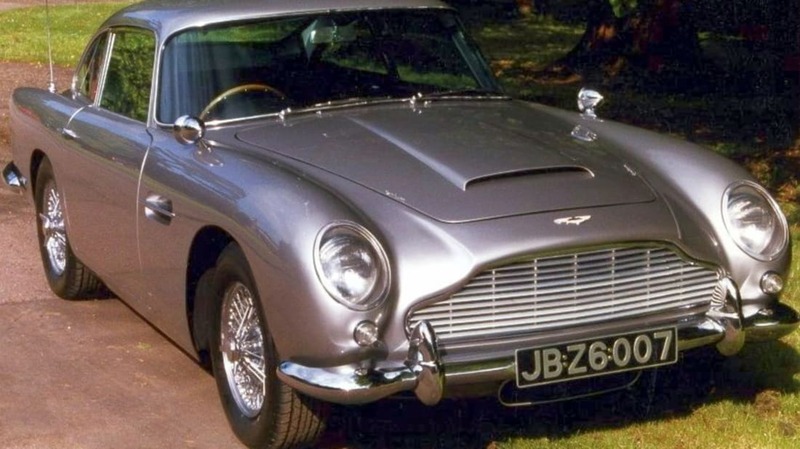 The other original Goldfinger Aston Martin DB5 was stolen in 1997 from an airport hangar in Boca Raton and has not been seen since. The most expensive movie costume ever sold is Marilyn Monroe’s iconic white dress from The Seven Year Itch (1955), which sold at auction in Los Angeles for $4.6 million in 2011. It was sold as part of actress Debbie Reynolds' amazing Hollywood costume collection, which also included the headdress worn by Elizabeth Taylor in Cleopatra (1963) and a bowler hat once owned by Charlie Chaplin. Reynolds had hoped to one day open a museum to display her collection of over 3500 items, but the project never came to fruition, and so (much to fans’ delight) Reynolds decided to sell. Picture Steve McQueen and it is likely that the image that pops into your mind is of him in his famous Le Mans driving suit. One of the three surviving suits used in the 1971 film Le Mans was sold in 2011 for $984,000. Amazingly, the iconic piece had been owned by Timothy Davies from Wolverhampton, UK, for 40 years after he had won it in a newspaper competition when he was just 12 years old. A Givenchy black dress made for Audrey Hepburn in Breakfast at Tiffany’s (1961) was sold in London for $807,000 in 2006. The massive price tag was a huge shock to experts, who had predicted it would sell for a maximum of $138,000. Hepburn, as Holly Golightly, wore a version of the dress in the opening scene of the movie as she steps out of a bright yellow taxi onto a deserted 5th Avenue in the early morning. Two other copies of the dress survive, one in Givenchy’s archive, the other in a costume museum in Madrid. The ruby slippers worn by Judy Garland in the The Wizard of Oz (1939) are thought to be one of the most valuable movie props in history, although they seldom come up for auction. Only four pairs are known to survive, one of which is on permanent display at the Smithsonian's National Museum of American History. The last pair to sell at auction in 2000 went for $666,000. The slippers were actually silver in L. Frank Baum’s original book, but producers felt that silver would not show up well against the yellow brick road on film, and the shoes were changed to the now-iconic ruby color. In 2005 a pair of the slippers were stolen from The Judy Garland Museum in Minnesota, and in 2015 an anonymous benefactor offered a $1 million reward to anyone giving information leading to their return. Six DeLorean DMC-12 cars (and one fiberglass replica) were bought for the filming of the Back to the Future trilogy. The original "A" DeLorean time machine car from the movie was carefully restored and is on display at Universal Studios Hollywood, while a second DeLorean is displayed at Universal Studios Orlando. In 2011 the third known DeLorean, having been through extensive refurbishment, came up for auction and sold for $541,000 with some of the proceeds going to the Michael J. Fox Foundation for Parkinson's Research. In 2016 a new DeLorean announced they would be manufacturing 300 new DMC-12 models, which are expected to cost about $100,000 when they go on sale in 2017. The statuette of the Maltese Falcon featured in the 1941 film of the same name, directed by John Huston and starring Humphrey Bogart as detective Sam Spade, became one of the most expensive pieces of movie memorabilia ever when it sold at auction in 2013 for $4.1 million. The lead statuette is generally touted as the original prop used in the film, hence its vast value, but a number of plaster falcons have been put forward as more likely candidates (after all, who wants to act while wielding a 45-pound lead prop when a 5-pound plaster one is available?). Since more than 75 years have gone by, the true falcon may never be identified for sure. The Ascot dress and hat worn by Audrey Hepburn in My Fair Lady (1964) was sold at auction in 2011 for an incredible $3.7 million. The Edwardian-style white lace dress, with black bow detail, was designed by legendary costume designer Cecil Beaton, who served as both costume designer and an art director on the film, work that subsequently won him Academy Awards in both categories. In 2014 the cowardly lion costume worn by Bert Lahr in the 1939 film The Wizard of Oz was sold at a New York auction for over $3 million. The costume was created from actual lion hides and weighs almost 60 pounds, which must have made it incredibly hot to wear under the studio lights. The costume sold at auction is stuffed and has a sculpted mask of Bert Lahr’s son's face, making it look spookily lifelike.